Among the most influential artists of the last hundred years, Marcel Duchamp holds great allure for many contemporary artists worldwide and is largely considered to be one of the founding fathers of modern art. 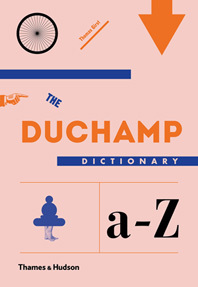 Despite this popularity, books on Duchamp are often hyper-theoretical, rarely presenting the artist in an accessible way. This new book explores the artist’s life and work through short, alphabetical dictionary entries that introduce his legacy in a clear and engaging way. From alchemy and anatomy to Warhol and windows, The Duchamp Dictionary offers a pithy and readable text that draws on in-depth scholarship and the very latest research. Thomas Girst includes close to 200 entries on the most interesting and important artworks, relationships, people, and ideas in Duchamp’s life—from The Bicycle Wheel and Fountain to Walter and Louise Arensberg, Peggy Guggenheim, Katherine Dreier, and Arturo Schwarz. Delightful, newly commissioned illustrations introduce each letter of the alphabet and accompany select entries, capturing the irreverent spirit of the artist himself.